SsangYong has a bit if a history with building robust 4WD vehicles. Starting nearly 60 years ago when they built Jeeps for the US Army and carried on through the various models since. Previous SsangYong Utes have been a mixed bag. We have previously reviewed the Actyon Sports Ute but this new Musso is a totally different vehicle altogether. We are testing the Musso Ultimate, the top of the range. SsangYong has been noted for a few things over the years, one is atrocious styling of some of its vehicles. However the new Musso isn’t too bad. I actually reckon the front view is quite appealing. Sharing the same underpinnings with the Rexton, the Musso is slightly shorter than what we are used to here in Australia. It looks like someone chopped about a qtr metre off the back. This is more apparent in the Ultimate, with its sports bar in the tray that makes the proportions look like a long body and short tub. It definitely looks like a SsangYong, but has a slightly rugged style, with a tapered bonnet, stylish grill and square lines through the sides. It’s a style that seems to neither stand out for good or bad. It looks ok. It also comes with HID headlamps Daytime Running Lamps (DRL) and Rear fog lamps. Low beam is excellent, high beam a little weaker. The load decks of Musso come equipped with a tough fitted load liner, a 12V/120W power outlet and rotating hooks to help tie down loads. The sports bar also makes it a stretch for shorter people to reach the tie down points. I just reached them. It could also do with a light back there. The load bed dimensions of 1300x1570x570mm means the Musso can easily swallow a Euro pallet and the Musso comes with 20 inch alloy wheels. A longer tub version is on its way apparently. Inside the Musso is reasonably comfortable. The electronically adjustable leather driver’s seat was actually quite comfortable. It didn’t have additional lumbar adjustment, but provided reasonable support. Both front seats are air conditioned. BIG tick SsangYong. The positioning for the driver to the steering wheel is good. The Musso is in the minority of Utes in having both reach and height adjustment for the steering wheel and that’s a plus. It frames the twin dial dash perfectly. The steering wheel itself is a styled leather clad thick rimmed design with controls for the audio, cruise control and the many faceted MFD between the dials in the instrument panel. It feels like it is from a vehicle that is much more expensive and is among the best dash layouts in Utes. For the driver, the higher waist line means that the elbow rest for the right elbow is a little high and hard on the point of your elbow. The centre console on the other hand is reasonably comfortable and a good height. Headroom will allow a hat to stay on the head. Driver ergonomics are first class and all round visibility is good, with the usual caveat for a thick ‘A’ pillar. I actually completely lost a car on a T intersection coming from the left. It got hidden by the ‘A’ pillar and the external rear view mirror. The whole centre console and stack is well laid out and surprisingly stylish. Rear seats are comfortable and given the design with long wheelbase and short tray there is reasonable leg room. In fact it is better back there in the Musso than the Amarok. The outside seats are also heated in the back, very handy. What isnt so handy is a lap seat belt only for the centre occupant. 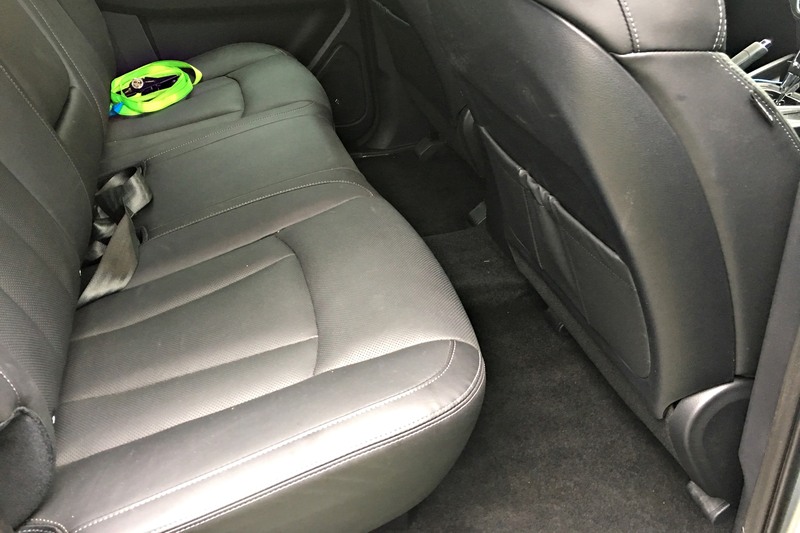 The back rests are a little short for taller drivers but visibility from the back seats also allows the kids to see what is happening outside rather than have their heads buried in some electronic device. At over 5 meters (5,095mm), the new Musso gives one of the largest cabin interiors in its class., thanks to a long wheelbase. Storage is good with dual bottle holders in the doors, twin cup holders, a reasonable size glove box and centre console bin. There are no USB ports in the rear though. Ultimate features an advanced infotainment system that includes AM/FM radio with Bluetooth connectivity, while Apple CarPlay and Android Auto come standard on the higher specification Ultimate models, as does a reversing camera. Other standard features include electric windows, cruise control, central locking, air-conditioning with fine dust filters and a 12V/120W power outlet in the cargo deck area. Being the top of the range, you would expect the Musso Ultimate to be blessed with additional features. There are a couple of features that are a slight negative, some in the process of being fixed, some a design feature. The GPS system comes from your phone. Now that is not an issue for city based drivers. However SsangYong have made a point of how good the Musso is off road and if that is the case and buyers venture far from normal cell phone reception, they will be left with no sat nav availability. A problem shared with Mitsubishi Triton, and quite frankly shows a lack of understanding of the market. The rear middle seat belt is lap only and needs to be fixed for general market acceptance and to attain the 5 star ANCAP safety rating, so I’m confident that will be rectified soon. The centre screen is clear and easy to read yet the buttons used the most are on the left side, further to reach for the driver. Musso is powered by the e-XDi220 engine found in the Rexton, delivering maximum power of 133 kW @ 4,000 rpm and a maximum torque of 400Nm @ 1,400 – 2,800 rpm, matched to 6-speed manual transmission or 6-speed Aisin automatic. It’s important to note that the Musso engine is Euro 6 compliant. Trying to use the auto transmission in manual mode means using a poorly designed flick button on the side of the transmission lever knob. Not that good really. It runs a part time dual range 4WD system with shift on the fly between 2WD and 4WD High. There is an automatic locking centre differential and a limited-slip rear diff, unfortunately there is no rear diff lock as standard or an option. Power is delivered permanently to the rear wheels, with front wheel drive dialled in electronically as required, with high and low ratios available as conditions demand. The system includes hill descent control and hill start assist to provide optimum grip, traction and safety. The ride and handling on the Musso is about middle of the road for the Japanese Utes. Better than some, not as good as others. The Ultimate has a little more road harshness trough the seat of the pants and steering wheel, but it isn’t too intrusive. The long wheelbase with shorter overhangs along with multilink coil suspension adds to the comfort. I had the Ultimate the same week as a Triton, which has always been known for a reasonable ride on road. When driving the SsangYong you felt you were driving a SUV, and when i jumped onto the Triton you knew you were driving a Ute. Starting with the rigid body on frame construction and the fitment of eight body mounts and large rubber engine mounts, the Musso has also been carefully tuned by Pininfarina to ensure low levels noise, vibration and harshness (NVH). Off road, on a reasonably mild but interesting forest track as well as the beach, the Musso took it all in its stride without fuss. I didn’t get to test the wheel articulation, but did test both high and low range. The torque delivery coming in at 1400 rpm certainly helps to keep the control on the right foot. Where is should be. While you may need to be careful on approach as the angle is a little shallow, the rampover angle is not bad as we never scraped our belly, despite some steep drainage mounds. There is the slightest lag on takeoff, but otherwise the delivery is linear and smooth. The 6 speed Asisin box is tried and tested in other Utes and works well. The speed sensitive steering is well weighted providing necessary feedback to the driver, meaning that it responds directly to driver input and allows direct control. Other drivers found it too light at speed, but I liked it. One very positive aspect is that the hill descent control is among the best in class and maintains speed without any hint of running away. Excellent feature! However this doesnt translate to cruise control, where the Ute ran away on the freeway. I didn’t get to test the towing ability, with the low powered engine and coil suspension. However note that another coil sprung Ute, the Nissan Navara took a few times to get the suspension right for towing. All models will have disc rear brakes, which puts the Musso ahead of 95% of the competition. For those that are seriously into towing, perhaps the longer tray, leaf sprung model that is coming early next year may be a better option as it will also have a higher payload (about 1120kg from memory). Also I am keen to have a longer drive with the Musso and tow, because as I have experienced in the past, having a headline figure of 3500kg towing capacity doesn’t always mean that you should actually do that. SsangYong range will come standard with autonomous emergency braking (AEB) and forward collision warning (FCW) from December 2018 production so they will land here in the first qtr. in 2019. This is when the vehicle will be tested for ANCAP safety rating. There is no rating at the moment. Other safety features include: – Lane Departure Warning (LDW), Tyre pressure monitoring system, Rear seat child anchor points, Blind Spot Detection (BSD), Front/rear park assist, Lane Change Assist (LCA) and Rear Cross Traffic Alert (RCTA) and 360° camera for enhanced safety. Even amongst the Dual Cab Ute brigade, there are different Utes that are better suited to different purposes. The SsangYong Musso is aimed at the recreational buyer that heads off road and wants to tow something. They may use it as a work truck as well. Given the slightly larger interior space it suits a family more than some other Utes. These buyers will also look for value over brand badging. The SsangYong Musso fits this criteria well. It is well suited to inner city and suburban work as well as forest trails, on the beach or trips to the snow. Towing light boats or trailers will also be well catered for. As far as a heavy duty 4WD to head across the Simpson, there may be more suitable choices. So do I recommend the Musso or not. There are definitely a few things currently missing. Things like reversing camera across the range, lap sash seat belts in the rear, Australian tuned suspension and underbody protection, some other safety features and a few more. But here is the balance. The Musso represents outstanding value. It has good build quality, despite missing a few features (many of which drivers have done without for years) it is very well equipped, is capable off road and will carry four adults in reasonable comfort (something that a lot of Utes can’t) and will tow 3500 kg. Let’s not forget the stunning owner support. Like every model in the SsangYong Australia range, the Musso comes complete with a comprehensive seven-year, unlimited kilometre warranty, seven years’ roadside assistance and seven years’ service price menu. SsangYong Musso sits closer to the Japanese Utes like the Isuzu D Max, Mitsubishi Triton etc and well above the latest crop of Chinese Utes that have bling but maybe not as much credibility. My feeling is that if you are looking at the Musso as a recreational vehicle, will be occasionally heading off road and towing and can live without a few niceties and recent safety features, then head to the nearest dealer. They will warmly welcome you and you will buy yourself a pretty bloody good Ute for an outstanding price.